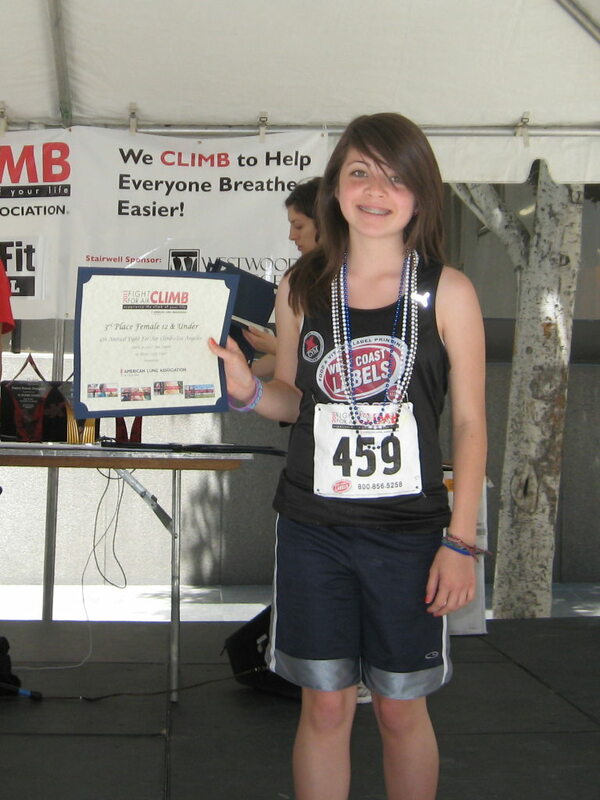 Today was the Lung Association’s “Fight for Air Climb” up the Aon building in downtown Los Angeles. 63 stories, 1377 steps, 858 feet from street level to the roof. 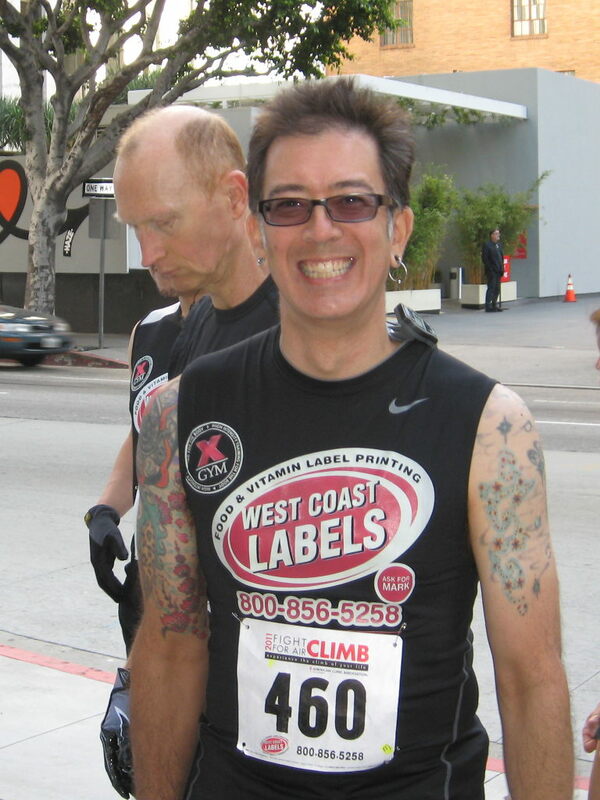 Back in 2009, this was my first competitive stair climb. At the time, I’d entered it on a lark, just because I was curious what it would be like to climb that many stairs, and also because I thought it would be novel to stand on the roof of the building. Now, two years later, I’m doing this one for the third time. I guess that means I like it, even though it’s still the hardest thing I’ve ever done. Lucinda and Kathleen were both doing it, too, just like the little one we did in San Diego. We all went downtown together. 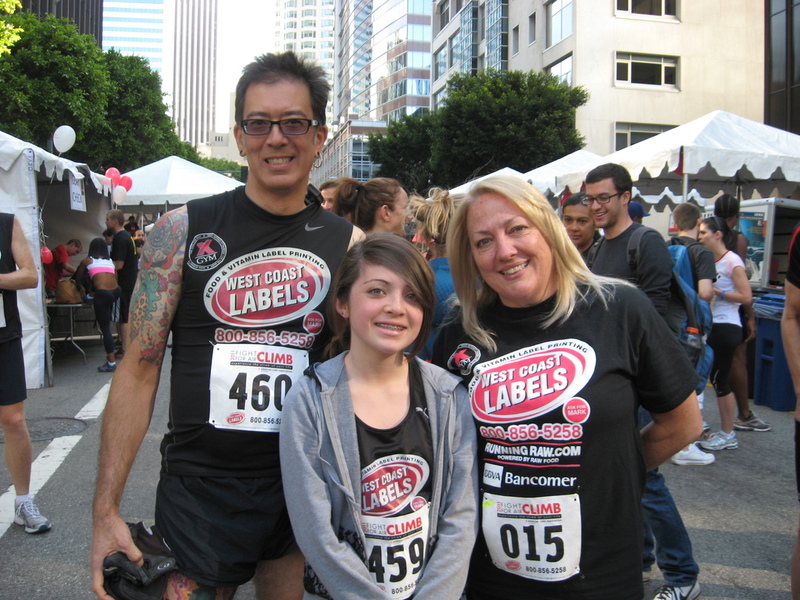 We were with Mark and his West Coast Labels team, which is a great thing. 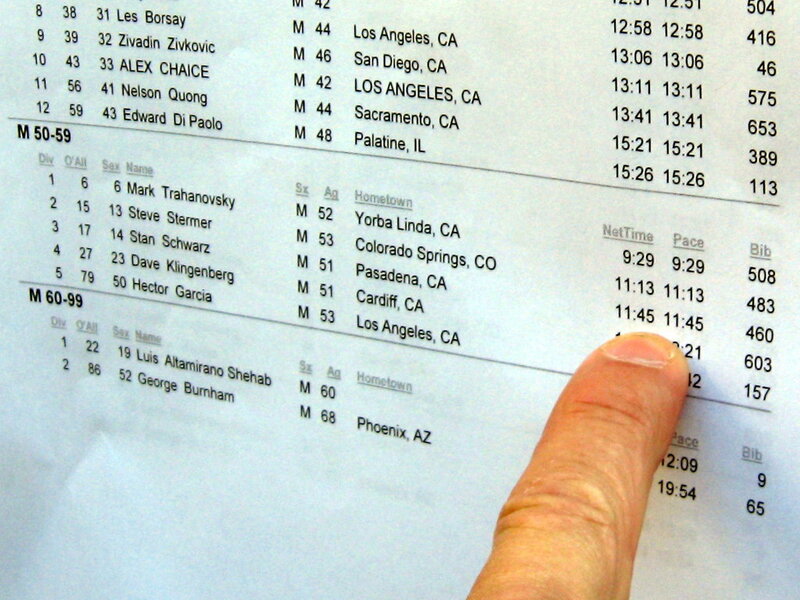 We got to go in the first group with the elite runners at 9:00. In my case, that meant that there were fewer people to pass on the way up, which generally makes for a faster time. Kathleen and Lucinda made a point to start at the back of our group, since they weren’t planning on going terribly fast. Still, it meant that we’d get to all meet up again at the top. When it as time to go, I trotted into the stairs and started climbing just like always. Once again, I left my metronome off for the first half of the climb. I just went at a comfortable but reasonably fast pace until I got to about the 30th floor. Then I turned the metronome on and used it as a target pace to maintain. Along the way, I passed a few of the people who’d started in front of me. At the 60th floor, I saw Randy’s wife, Lynn. She took pictures as I went by. I guess that the fact that I even noticed that she was there maybe meant that I wasn’t going fast enough. From there, it was just a couple more floors. When I saw the light from the roof door, I managed to find a little bit extra for a final sprint up onto the roof. As soon as I passed the timing mat, I got down on the ground and panted for a few minutes. Then I spent a few minutes looking at the view before I saw Lucinda come out of the stairway. We sat down and had some water while we waited for Kathleen. It was a nice day, and it was a good day to be up there. When Kathleen got there, she sat down and rested for a few minutes before we all headed back down the other stairs to the party on the 60th floor. While we were there, I saw two girls with some very nice and large tattoos, so I went and found Oz and Randy so we could all do a picture of the tattooed stair climbers. By then, word came up from the ground that they were posting the times. I was pleasantly surprised to see that my time was 11:45, which was only three seconds slower than last year, which is pretty much the same speed. While I’d have liked to go faster, it apparently wasn’t in the cards this time. But that was all right. 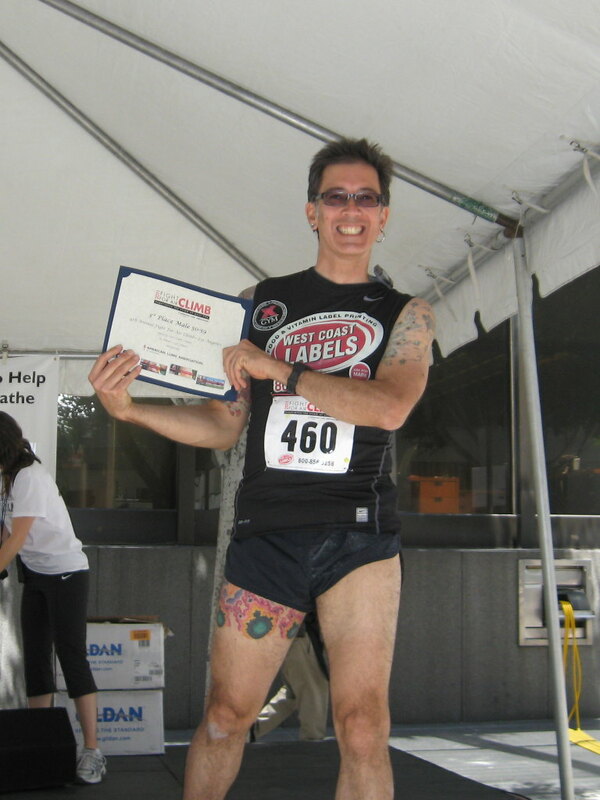 In the end, it was good for 3rd place in the 50-59 age group, and 19th overall, out of 547 runners. I can’t complain about that. Lucinda did well, also. 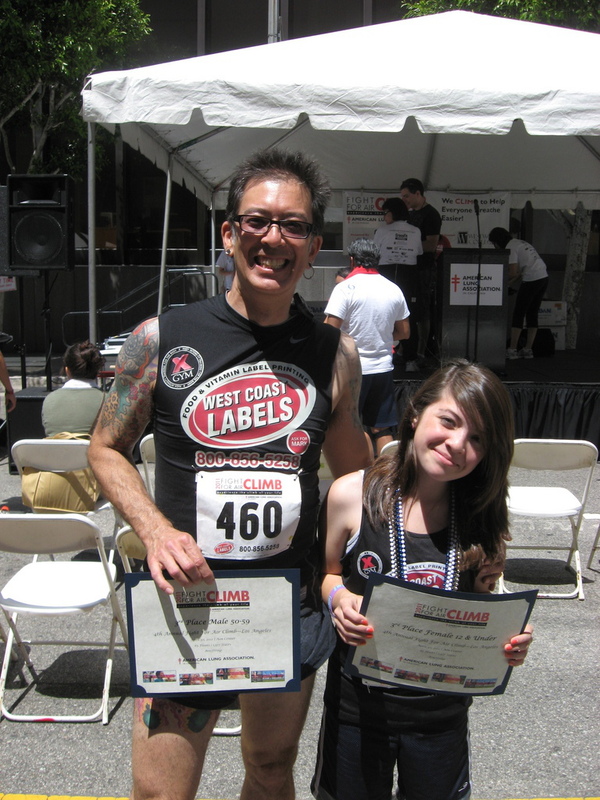 Her time was 20:57, which was good for 3rd in her age group, and was also faster than more than 50% of the women there. That’s not bad at all. So we both got a little podium time at the end. 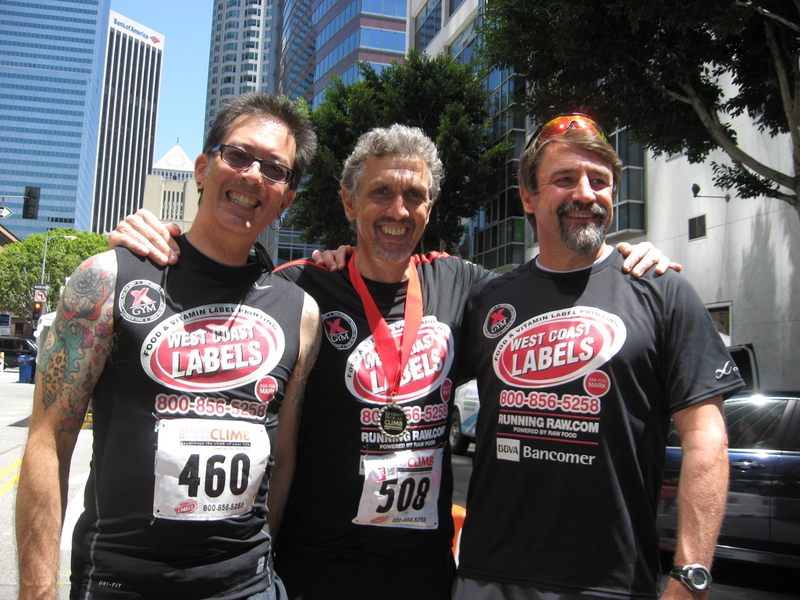 And Mark and the West Coast Labels group got the fastest times in almost all the age groups. Overall, it was a fun outing. 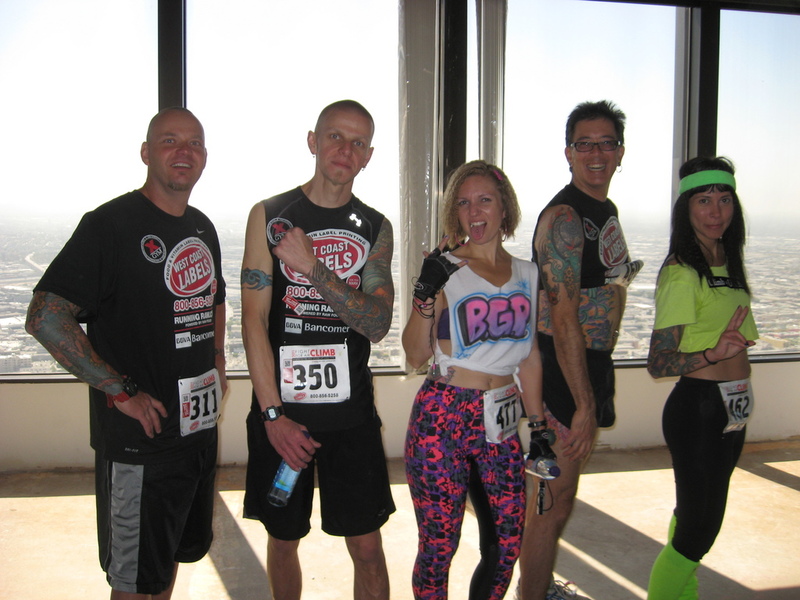 Now we will take a break and come back in the fall at the U.S. Bank tower climb.